Someone came to the surgery the other day, and this happens a fair bit, they apologised for their teeth. It reminded me that I should put ‘something on the website’ about this, as we’re really not here to judge anyone and people should not feel the need to be embarrassed (even if it is human nature). You see, its only when people really need us that we get to make the most difference. And if its not too selfish of us, we’d be delighted to see you. You may have heard of the dental wand, but if you haven’t seen it and want to know how it works, this is for you. Although Matt told me this would be fun, I’m not sure now – it’s always horrible hearing yourself speak isn’t it? All feedback and reviews welcome, I hope you find it useful. I’ve written before about pain free dentistry, and that it shouldn’t be an optional ‘extra’. We’re all human, and none of us would look forward to needles and discomfort. 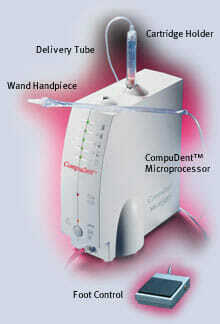 We always use the dental wand to make the visit as painless as possible. But, although this technology has been around for a while, most new patients are as wary as ever. I’m hoping that some day this worry might simply just go away. It would certainly make for less stress the day before the visit – from most people’s accounts. But a good friend set me thinking about this again the other day whilst in the chair. He asked if we were busy or not, which we pretty much always are. Its a common question, and then it dawned on me, as he was looking around. He has a very sensitive mouth, and I can almost go and make a cup of tea whilst we’re waiting for him to be ready for treatment – except it’s nice to have the time catch up. People do vary in the amount of time it takes for their mouths to numb. And the key is definitely ‘not to rush’. Don’t rush the anaesthetic, use the proper amount according to the patient, and don’t rush the treatment. It’s been fairly second nature for quite some time in dentistry, and so perhaps we didn’t tell everyone we needed to (hence this post). My view is that with the right planning, there is time to do everything we need to and communicate, which is our other key tool! Perhaps I will ask Damien to write about the dental sedation skills he’s bringing to the practice too, it might be useful for people to know a bit more about that, and we often work together. Watch this space. We didn’t exactly push this facility, it felt a bit like fishing for compliments – but someone just pointed out that people might actually want to have the opportunity. So, for any of our existing patients please find the facility in the reviews section in the above drop down menu, and click the link. You can enter feedback directly into the form. Our latest colleague at Winning Smiles, had some positive feedback recently, and because it is directly about his dental sedation – which addresses a lot of people’s desire for ‘painless dentistry’ – we thought we’d produce an excerpt here. I came in for 4 hours sedation with your FANTASTIC sedationist Doctor Damian. It was recommended as I needed 10 upper crowns and surgery to even up my gum lines. This involved a very lengthy treatment, which thankfully I was not aware of. Amazingly I was told to eat and drink before treatment. The drug process to put me to sleep was not in the least bit traumatic. It only involved a tiny needle, with just one drop at a time of the drug. When I came round, I did not feel unwell in the least (just not quite with it). It was a totally stress free experience, and I recommend it to anyone undergoing lengthy/complex work. Ruth is extremely generous in terms of her comments, but also the time taken to feed back on this site. We’re just a bit worried now that it looks like we’re paying her instead of the other way round! With the right skill, care , topical anaesthetic gel and a little known piece of dental wizardry called ‘The Dental Wand‘ we can make teeth, gums and even the whole jaw (for implant surgery) numb without the patient feeling a thing. At my practice in Essex, this is so routine I don’t even think about it anymore. Just as in many dental surgeries the world over, dentists have come to take a little toe-curling and a wince from the patient as they administer their injections of local anaesthetic for granted, the opposite is true at Winning Smiles. This was borne out for me the other night when my last patient came in for a clinical examination. Being my younger brother he hasn’t been in for years so obviously there was work to do…..and being my younger brother I thought I’d better do it straight away otherwise he’d just go away and wait for the abscess to develop! Giving him a lift to the station he said ‘Wow, you don’t use injections any more, that gel stuff works really well!’…and I realised that after I had painted topical gel on the gum, he didn’t feel a thing until we were all done! Now that’s not difficult, is it? So why are so few dentists using it, oh I forgot, making your patients wince is ok…..
A patient of mine came back from the States recently. A friend of hers had just come back from the dentist over there….and Teresa was surprised to find out that her friend had been subjected to the old fashioned injection – in the land of advanced dentistry!